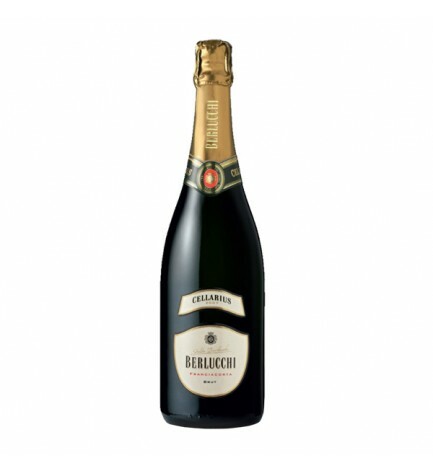 70% chardonnay, 30% pinot noir, grown exclusively in Berlucchi estate vineyards, many of the high-density plantings. Varies between 80-100 quintals per hectare, with a yield in must of 45%. Gentle, gradual pressing, with quality fractioning of the must, and initial fermentation in stainless steel. A small quantity ferments in oak barriques, where it undergoes malolactic fermentation as well, and it matures there sur lie for 6 months. Assemblage of the cuvée in the spring following harvest, with only wine from that specific vintage. Bottled with a liqueur de tirage of 24 g/l sugar and cultured yeasts. Maturation sur lie for a minimum of 30 months, followed by an additional 3 months following disgorgement. The territory of Franciacorta is a section of the Province of Brescia in the Italian Region of Lombardy. Franciacorta extends from Mount Orfano (south of Rovato) on the southest area to the shores of Lake Iseo, and from the river Oglio on the western border to the town of Cellatica in the east. The geography of rolling hills was shaped by glacial action. The soil, glacial moraines consisting of gravel and sand over limestone, drains well, and is ideal for the cultivation of grapes and winemaking. The weather is mild and constant due to its location south of the foothills of the Alps and the tempering presence of large lakes. To publicize enotourism the district established a Strada del Vino Franciacorta on the model of the famed German Wine Route (Weinstraße) in 2001. The area has been inhabited since Paleolithic times, with archaeological records left by Gauls— the Cenomani of Brixia (modern Brescia), Romans and Lombards. The name Franciacorta, attested in 1277, is thought to derive from curtes francae, the fortified courts of the Frankish empire established in the 8th century. Rodengo is home to a Cluniac foundation, the Abbey of St. Nicholas, which has been inhabited by Olivetan monks since 1446. Other places of interest include Passirano, with a castle, and Provaglio d'Iseo, with a Romanesque church.